For other people of the same name, see Frank Hughes (disambiguation). 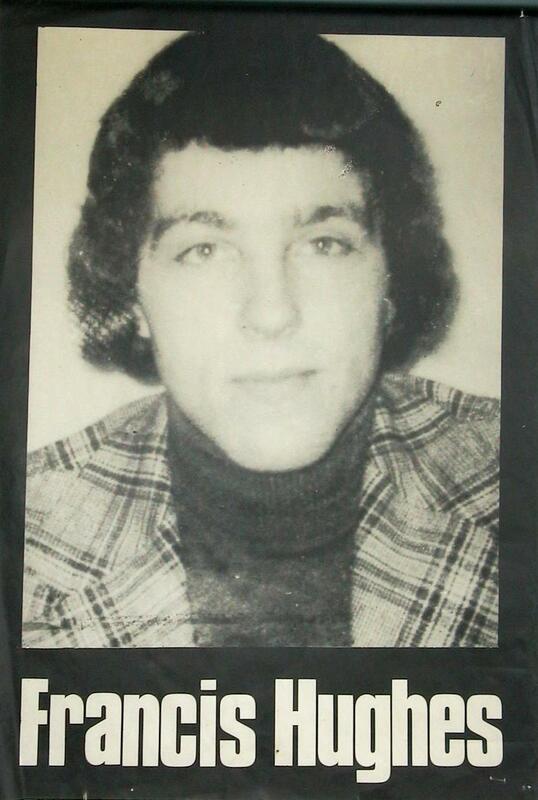 Francis Hughes (28 February 1956 – 12 May 1981) was a volunteer in the Provisional Irish Republican Army (IRA) from Bellaghy, Northern Ireland. Hughes was the most wanted man in Northern Ireland until his arrest following a shoot-out with the Special Air Service (SAS) in which an SAS soldier was killed. At his trial he was sentenced to a total of 83 years' imprisonment; he died during the 1981 Irish hunger strike in HM Prison Maze. Hughes was born in Bellaghy, County Londonderry on 28 February 1956 into a republican family, the youngest of four brothers in a family of ten siblings. Hughes' father Joseph had been a member of the Irish Republican Army in the 1920s and one of his uncles had smuggled arms for the republican movement. This resulted in the Hughes family being targeted when internment was introduced in 1971, and Francis Hughes' brother Oliver was interned for eight months without trial in Operation Demetrius. Hughes left school aged 16 and started work as an apprentice painter and decorator. Hughes was returning from an evening out in Ardboe, County Tyrone when he was stopped at an Ulster Defence Regiment (UDR) checkpoint. When the soldiers realised he came from a republican family, he was badly beaten. Hughes' father encouraged him to see a doctor and report the incident to the police but Hughes refused, saying he "would get his own back on the people who did it, and their friends". On 18 April 1977 Hughes, McGlinchey and Milne were travelling in a car near the town of Moneymore when an RUC patrol car carrying four officers signalled them to stop. The IRA members attempted to escape by performing a u-turn, but lost control of the car which ended up in a ditch. They abandoned the car and opened fire on the RUC patrol car, killing two officers and wounding another, before running off through fields. A second RUC patrol came under fire while attempting to prevent the men fleeing, and despite a search operation by the RUC and British Army (BA) the IRA members escaped. Following the Moneymore shootings the RUC named Hughes as the most wanted man in Northern Ireland, and issued wanted posters with pictures of Hughes, Milne and McGlinchey. Milne was arrested in Lurgan in August 1977, and McGlinchey later in the year in the Republic of Ireland. Hughes was eventually captured on 17 March 1978 near Maghera in County Londonderry after an exchange of gunfire with the British Army. A member of the Parachute Regiment, L/CPL David Jones, was killed in the gun battle, and another paratrooper seriously wounded. Hughes was wounded in the leg. He managed to limp away but was discovered the next morning in a search and surrendered to British troops. In February 1980 he was sentenced to a total of 83 years in prison. Hughes was tried for, and found guilty of, the murder of one British Army soldier (for which he received a life sentence) and wounding of another (for which he received 14 years) in the incident which led to his capture, as well as a series of gun and bomb attacks over a six-year period. Security sources described him as "an absolute fanatic" and "a ruthless killer". Fellow republicans described him as "fearless and active". Gravestone erected to Thomas McElwee and Francis Hughes. Hughes was involved in the mass hunger strike in 1980, and was the second prisoner to join the 1981 Irish Hunger Strike in the H-Blocks at HM Prison Maze. His hunger strike began on 15 March 1981, two weeks after Bobby Sands became the first hunger striker. He was the second striker to die, at 5:43pm BST on 12 May, after 59 days without food. His death led to an upsurge in rioting in Irish nationalist areas of Northern Ireland. His cousin Thomas McElwee was the ninth hunger striker to die. Oliver Hughes, one of his brothers, was elected twice to Magherafelt District Council. He is portrayed by Fergal McElherron in the film H3. ↑ 6.0 6.1 Ten Men Dead, p. 115. ↑ 8.0 8.1 8.2 8.3 The Trigger Men, pp. 124–126. ↑ The Trigger Men, p. 127. ↑ 10.0 10.1 10.2 10.3 10.4 Ten Men Dead, p. 117–118. This page was last modified on 22 December 2015, at 16:58.